There were two family birthdays in September which means it was time to test-drive some recipes for birthday cookies again. As usual, I had a stack of contenders waiting to be baked and tasted. 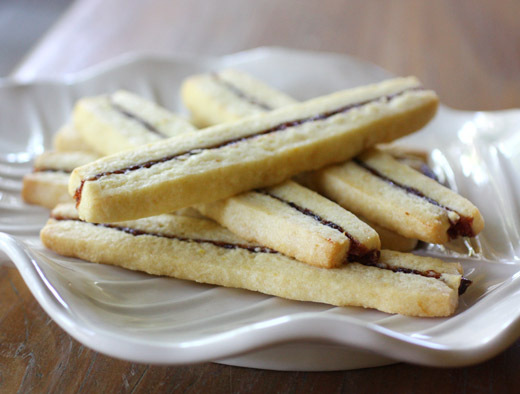 One that seemed like it couldn’t possibly fail was this recipe for shortbread fingers from Donna Hay magazine. It’s from an article about holiday cookies from last year, and there are a few other options in that article that I want to try as well. The recipe isn’t available online, so I’ll include it below. It’s an easy-enough recipe, but plan ahead since you really do need to chill the dough in the freezer at two points in the process. With frozen, firm dough sandwiching a sweet and tangy sour cherry jam, long, skinny cookies are a cinch to cut. The shortbread bakes into golden crunchiness, and there’s just enough jam in the middle for good, fruity flavor without being too sweet. First, you need to make the jam, and it can be made in advance and stored in the refrigerator. It’s a quick puree of dried sour cherries, strawberry jam, and sugar. The original recipe suggested cooking the jam for a couple of minutes after it was pureed to thicken it. Mine was thick enough, and I skipped the cooking step. If your mixture seems runny, place it in a small saucepan, bring to a boil, and cook while stirring for a couple of minutes until it thickens. For the shortbread, butter and sugar were mixed until fluffy, and an egg and vanilla extract were added. Flour, baking powder, salt, and lemon zest were added and mixed to combine. Then, the dough was divided into equal parts, and each piece of dough was rolled, between sheets of parchment paper, into a rectangle. The dough rectangles will be stacked, so they need to be pretty close to the same size. The dough rectangles were chilled in the freezer. Once firm, one piece of dough was spread with jam and topped with the second piece of dough. The stacked dough was then returned to the freezer for an hour. Before cutting the long, finger shapes, the dough edges were trimmed, and then the cookies were cut and placed cut side down on silpat-lined baking sheets. The cookies baked for about 14 minutes and were cooled on the baking sheets. My assumption about this recipe was correct. It definitely didn’t fail, and the cookies were sturdy enough to be packed and shipped. Of course, they could have been filled with any flavor of jam, but sour cherry was a good match with the lemon in the shortbread. I’ll be adding this cookie recipe to the permanent file. -Make the sour cherry jam: place the cherries, jam, and sugar in a food processor and puree until mixture forms a paste. Refrigerate until needed. -Make the shortbread: place the butter and sugar in the bowl of a stand mixer and beat until pale and fluffy. Add egg and vanilla and mix to combine. In a medium bowl, sift together flour, baking powder, and salt and add lemon zest. With mixer on low speed, add the dry ingredients and mix until just combined. -Divide the dough into two equal parts, and roll first piece of dough between sheets of parchment paper. You want the dough to form a rectangle roughly six inches by eight and one-quarter inches (16cm x 22cm). Repeat with second piece of dough. Place the parchment-covered dough rectangles on a baking sheet and set in the freezer for about 30 minutes. 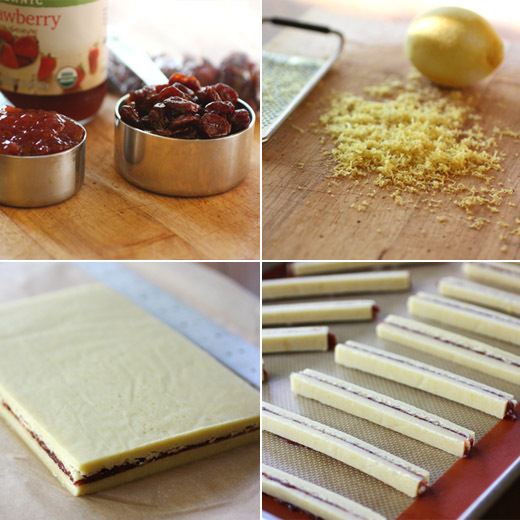 -Remove the top layer of parchment from one dough rectangle and spread with the cherry jam. Top with the other dough rectangle, and cover with parchment. Place this sandwiched dough back in the freezer for an hour. -Preheat oven to 350 degrees F (180C). Remove dough from freezer and discard top piece of parchment. Trim the edges of the dough to make a straight-sided rectangle. Cut long, skinny cookies about three-eighths of an inch wide, and place them cut side down on lined baking sheets. Bake for about 14 minutes or until the edges are golden. Cool on baking sheets. Divine and perfect with a cuppa! These look terrific. Lemons and cherry is a nice combo. And this is a simple recipe that looks pretty spiffy. Good stuff - thanks. Perfect with a cup of coffee now! Shortbread and jam are such a hypnotic pairing! The Donna Hay recipe is so elegant. These are just buttery jam fiiled goodness! These are gorgeous! I love the pre-baked shot, so perfect! The lemon cherry combo is one of my faves so I have no doubt I would love these. I love shortbread, it's really my favorite cookie to eat. Yours look so everly tempting Lisa! Wow, these are beautiful, Lisa! And I love that you filled them with your own homemade jam...they sound superb! What a fascinating recipe! First, that no-cook cherry jam recipe is perfect for me! Perfect! And Sour Cherry Preserves are the only thing I eat jelly-wise at home. I am fascinated that the layers with the jelly in between get all baked together. I love these and they are perfect for gift giving at the holidays, which I love to do. How sweet that you send family members birthday cookies! And how lucky they are because these look scrumptious. 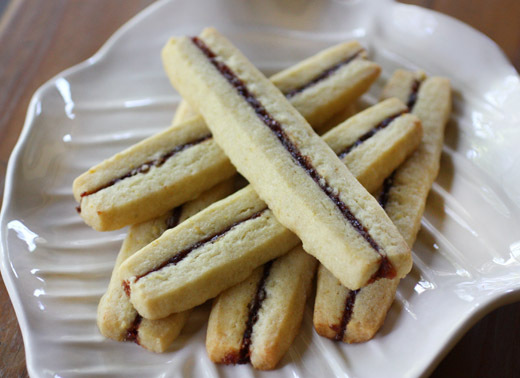 These shortbread fingers look beautiful! Lisa, such a brilliant idea. I love shortbread every which way ( and they are a great option for gluten free folks like me) and to add jam in the middle. Yum! i LOVE cherry jam, so much so that i doubt much of it would've made it long enough to get squished between those delicious cookies. nice, lisa! Your shortbread cookies are lovely. I have a jar of sour cherry jam in my pantry that I didn't have any plans for...now I do. Scrumptious - I like the dried cherries, strawberry jam mixture for the filling! What gorgeous cookies and lovely bright flavors to celebrate birthday. These cookies are so perfectly cut and look so great! I think I'd break those in two seconds! I adore shortbread...who doesn't! I bring those little Scottish packets of shortbread in my purse when I travel through airports as my special treat. With the jam in the middle, these look so good. And, yes, they sure did come out perfectly! Very sophisticated biscuits - beautiful pairing of lemon and sour cherry. I would love to try one (or many) of those biscuits! Donna Hay always does such great presentations. I love the way these shortbread sandwiches have a modern look with their skinny-jeans-like appearance.